The Lagos State Government held a meeting with stakeholders in the state to clarify the issue around its review of the Land Use Charge. The forum was organised by the Lagos Chamber of Commerce and Industry (LCCI), and had the state’s Commissioner for Finance, Akinyemi Ashade, explain how the charge is calculated. The Land Use Charge law institutes the regime of self-assessment. The intent of the reviewed Law is for Lagosians to be able to compute the amount payable on their respective property by themselves. You don’t have to wait for demand notices before your pay your charges, you can calculate it yourself, engage us, you can make your payments voluntarily. Do it yourself, let’s dialogue and let’s get the basis right. If you are a landlord and you are the only one living in your house with your family, your annual fee is 60% of the value of the house × 0.076%. Secondly, If you are a landlord living with your tenant in the same building value of N20million, you will pay 0.256% of (60% of N20m) =0.256% × N12m= N30,720.00 per annum. Thirdly, If you rented out the house to tenants only and you don’t live there and the house is worth N20million, you will pay 0.76% of (60% of N20m) = 0.76% of N12m = N91,200.00 per annum. The Law does not tax the market value of properties. It gives a general discount rate of 40% to all property owners in the state. 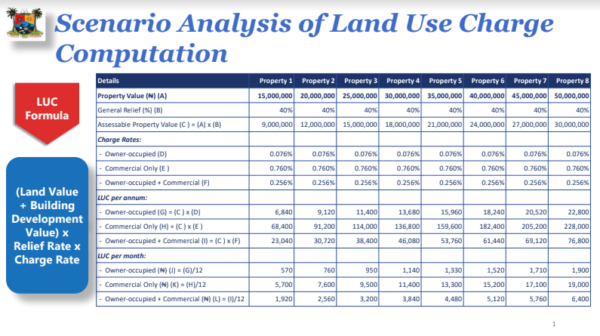 The Land Use Charge Law is holistic and fair to everybody. It is quite undiscriminatory. It is not one cap, fit all. Market value of properties in Ikorodu and Ikoyi can never be calculated as the same.